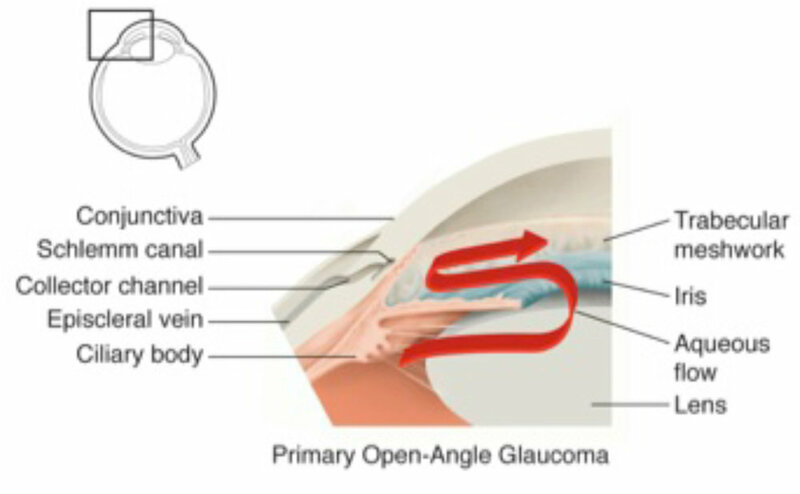 There are numerous types of glaucoma, of which Angle Closure Glaucoma is one. Unlike Primary Open Angle Glaucoma, Angle Closure Glaucoma often has subtle symptoms. These often occur after you have been in the dark for an extended period such as the movie cinema. These symptoms may include headache, blurred vision and nausea but many patients still have no symptoms at all. You are more likely to develop angle closure glaucoma if you are long sighted (“hyperopic”) or Asian. Glaucoma leads to damage to the optic nerve (“the optic disc”) within the eye. Over time this leads to loss of peripheral vision (“tunnel vision”) and in severe cases can even lead to blindness. The damage is permanent and irreversible. This damage is due to raised pressure inside the eye (“intraocular pressure or IOP”). Think of the eye as a car tyre – if the pressure of the tyre is too high over a long period of time then it will wear out. The same applies to your eyes. This damage is seen in an increase in the “cup to disc ratio”. The front part of the eye contains fluid called aqueous that is produced by pump cells inside the eye called the ciliary body. This fluid is supposed to pass through the pupil and across a membrane called the trabecular meshwork. In angle closure glaucoma the iris, which is the muscle that creates the pupil, blocks the flow of this fluid. This creates a pressure differential that pushes the iris forward and completely blocks the trabecular meshwork so that aqueous fluid cannot leave the eye and the pressure rises precipitously. In some cases this pressure rise can so suddenly and severely that blindness can occur in a few hours. This is called Acute Angle Closure Crisis. Treatment of angle closure involves fashioning a small tunnel in the iris with a LASER. This tunnel creates a “short cut” for the aqueous fluid to avoid the problem of pupil block. This laser is performed in the LASER Suite at the Queensland Eye Institute as an outpatient. Medicare rebates and the Medicare Safety Net apply. Treatment of Acute Angle Glaucoma.